Google AdWords has a very handy report built-in that will answer an age-old question that continues to come up very regularly with us. Are your competitors bidding on your dealership name? Are they advertising/bidding on keywords in your primary market area? Both of these tactics are typically forbidden by the OEM as part of the franchise agreement and co-op reimbursement. What’s difficult is to really ‘prove’ this without a doubt. There are a lot of moving parts to AdWords, and customized search results, and unintentional actions (to the uninformed) that come up when you try to ‘show’ this by doing your own Google searches online. We can use a built-in report called Auction Insights to answer a lot of questions. What Questions Can Auction Insights Answer? Are my competitors bidding on my name? Are my competitors bidding in my primary market area? Are my ads outbidding tier 1 or tier 2 advertising? Are my ads overlapping with tier 1 or tier 2? How often is any of the above happening? Where do I rank when the above is happening? The Auction Insights Report lets you compare your performance with other advertisers who are participating in the same auctions as you. This information can help you make strategic decisions about bidding and budgeting choices by showing you where you are succeeding, and where you may be missing opportunities for improved performance. Impression share “Impression share” is the number of impressions you received divided by the estimated number of impressions you were eligible to receive. Eligibility is based on your current ads' targeting settings, approval statuses, bids, and Quality Scores. This number is updated once a day. Avg. Position “Average position” shows you how your ad typically ranks against other ads. Overlap Rate “Overlap rate” is how often another advertiser’s ad received an impression in the same auction that your ad also received an impression. Position Above Rate “Position above rate” is how often another advertiser’s ad in the same auction shows in a higher position than your own, when both of your ads were shown at the same time. Top of Page Rate “Top of page rate” is how often your ad (or the ad of another advertiser, depending on which row you're viewing) was shown at the top of the page in search results. Outranking Share “Outranking share” is how often your ad ranked higher in the auction than another advertiser’s ad, or if your ad showed when theirs did not. Knowing what’s going on outside of your own Ad account, and how you compare to others (bidding on the same keywords), can help you see the bigger picture. But don’t just go nuts trying to ‘win’ by these numbers. You could blow the bank trying to win these numbers and get no further ahead. Being at the top comes at a price financially, one that may not be as smart as being 2nd or 3rd. 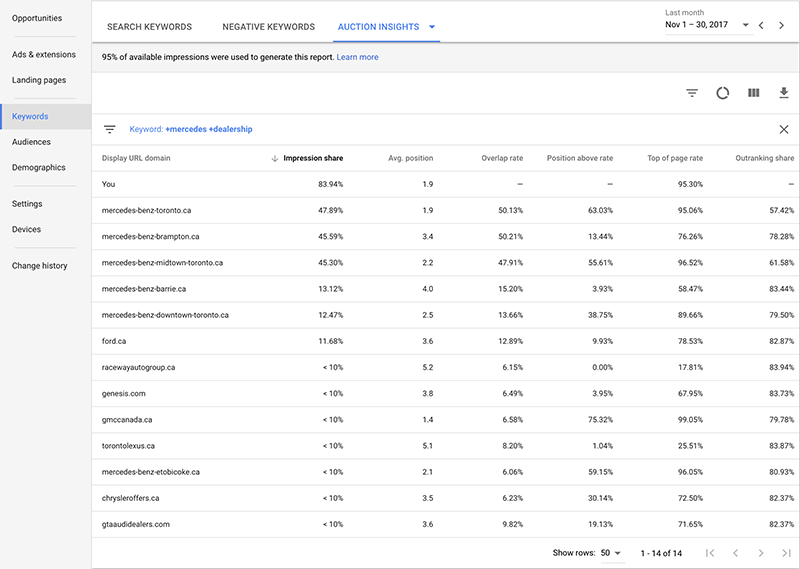 This report is only available directly from AdWords so you will have to retrieve this from your agency, or directly from your AdWords account if you have access to it.